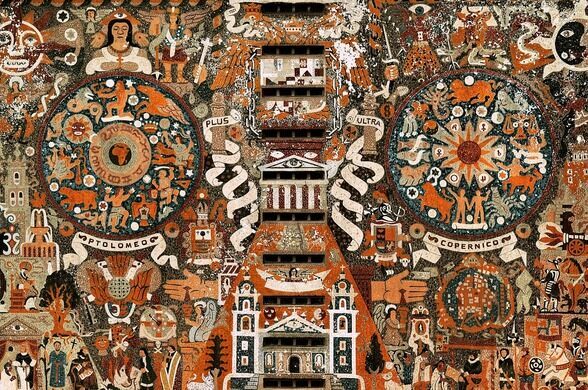 This incredible college library is a visual masterpiece of mosaic art. It also looks kind of like a giant boombox. 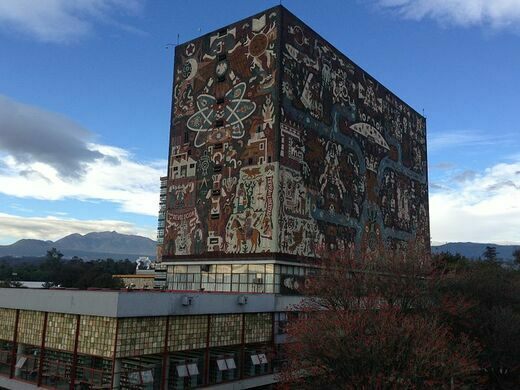 In general, libraries are most known for the wonders they hold inside, but the Central Library on the campus of the National Autonomous University of Mexico (UNAM) wears its most incredible feature on its facade. Covering every inch of the 10-floor building’s exterior is a colorful stone mural illustrating events from Mexico’s past, present, and imagined future. Also, it kind of looks like a giant prehistoric boombox. An extravagant 18th-century fountain built with bits of broken ceramic. Originally opened in 1956, the library building is most evidently the work of artist Juan O’Gorman. Though the building’s architecture is blocky, windowless, and monolithic, the artist created colorful designs that cover the entire surface of all four sides. 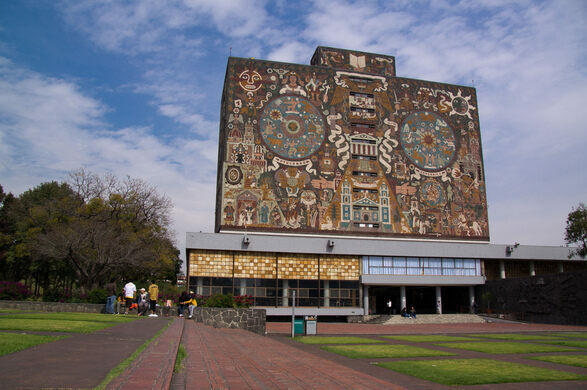 The designs were inspired by a quartet of historical epochs, with the north wall representing the pre-Hispanic period; the south wall, the colonial period; the east wall, the modern era; and the west wall, the university’s history. The colorful decorations turn what could have been an imposing institutional block into a vibrant attraction that’s both a piece of history and a piece of art. And again, thanks to a little block jutting up from the roof like a handle, combined with the circular depictions of the Ptolemaic and Copernican visions of the universe, it really looks like a massive boombox built by an ancient civilization. And the decorations get even more incredible up close, as they aren’t simply painted onto the walls, but composed of designs illustrated with a variety of types of local stone, each chosen for its natural color. Amazingly, all of the reds, greens, blues, yellows, and other colors are created with naturally colored stones obtained from all over Mexico. O’Gorman chose this method because as opposed to paint and other mediums because he knew the stones wouldn’t fade away. The UNAM Central Library is an incredible building that manages to encapsulate the country’s rich history with a kind of symbolic visual poetry, writ large. It almost has to be seen to be believed. But seriously, you guys see how it looks like a boombox, right? This mid-century mural portrays humankind's spiritual and scientific journey. A gigantic, symbolic artwork covers the side of the building. A long-vacant Scottish Rite temple in Hollywood has been converted into an art museum filled with Masonic relics.